Andy Warhol was the most successful and highly paid commercial illustrator in New York even before he began to make art destined for galleries. Andy Warhol’s screenprint images of Marilyn Monroe, soup cans, and sensational newspaper stories, quickly became synonymous with Pop art. The quintessence of Warhol’s art was to remove the line between Fine Art and Commercial Art used in magazine illustrations, comic books, record albums and advertising campaigns. He once expressed his philosophy in one poignant sentence: “When you think about it, department stores are kind of like museums”. Andy Warhol established The Factory, Warhol’s art studio, hangout, and film stage where Warhol and his art assistants congregated with B-film actors, musicians, celebrities and the social elite all of which inspired or took part in Warhol’s creative mass production process. 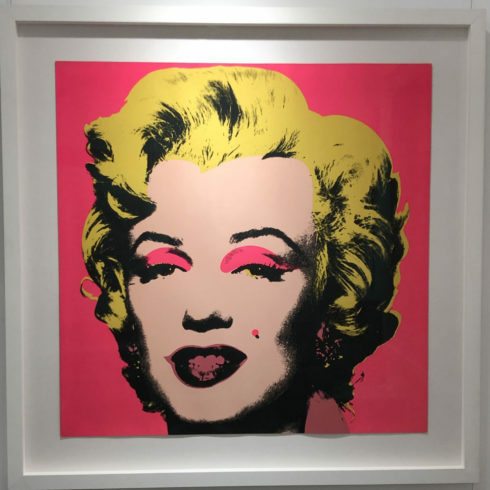 Our fine art gallery has the finest quality Andy Warhol original prints, screen prints, lithographs, silkscreen, Marilyn, signed artworks, and posters. We encourage you to make an appointment to see specific works you are looking to collect. We are happy to meet you at either our art gallery showroom or at your home or office for a private presentation. Artist Andy Warhol was born in 1928 in Pittsburgh, Pennsylvania the son of working-class Slovakian immigrants. Warhol’s father was a construction worker and died in an accident when Warhol was 13 years old. A sickly child and often confined to bed, Andy Warhol showed an early talent in drawing and painting. After high school, Andy Warhol studied commercial art at the Carnegie Institute of Technology in Pittsburgh. Warhol graduated in 1949 and went to New York where he worked as a commercial illustrator for magazines like Vogue, Glamour and Harper’s Bazaar. 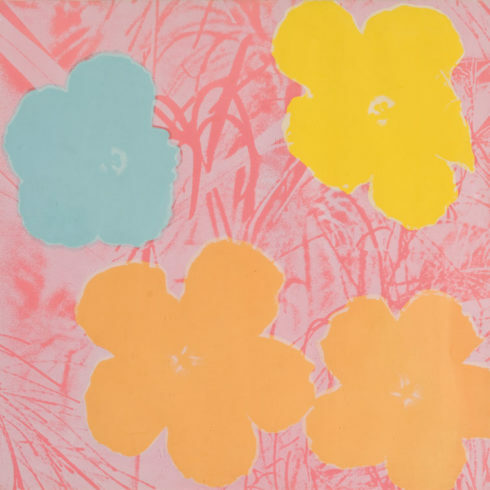 Warhol’s whimsical and distinct art quickly gained attention and Warhol enjoyed a successful career as an illustrator. Andy Warhol changed the spelling of his name in 1949 after he was credited as “Drawings by Warhol” for the article “Success is a Job in New York”. In 1952 Andy Warhol had his first one-man show at the Hugo Gallery in New York, and by 1956 Warhol had taken part in an important group exhibition at the renowned Museum of Modern Art. In the early sixties, Andy Warhol started painting ordinary mass-produced items like Campbell Soup Cans, Brillo Boxes, and Coke bottles and soon became a famous figure in the New York art scene. In 1962 on Andy Warhol started making silkscreen prints of famous personalities like Marilyn Monroe, Elvis Presley, Elizabeth Taylor and Jackie Kennedy among others. In June 1968 the Andy Warhol was shot by Valerie Solanis—a minor figure in the in The Factory crowd who had founded a group named SCUM (Society for Cutting Up Men)—she was also its president and sole member. Andy Warhol was seriously wounded and only narrowly escaped death spending two months in the hospital. When Solanis was arrested the day after, her words were “He had too much control over my life”. Andy Warhol never recovered completely from his wounds and had to wear a bandage around his torso for the rest of his life. After the assassination attempt, Andy Warhol made a radical turn in his process of producing art. The philosopher of artistic mass production now spent most of his time creating commissioned art portraits of the rich and famous including Michael Jackson, Liza Minnelli and Brigitte Bardot. Warhol’s activities became more and more entrepreneurial. Warhol created the magazine Interview and even co-owned a night-club. In 1974 The Factory was moved to 860 Broadway. In 1975 Warhol published THE philosophy of Andy Warhol. In the book, Warhol describes what art is: “Making money is art, and working is art and good business is the best art.” During the 1980s Andy Warhol collaborated with younger emerging artists such as Keith Haring and Jean-Michel Basquiat. Andy Warhol died February 22, 1987, from complications after gallbladder surgery. More than 2,000 people attended the memorial mass held at St. Patrick’s Cathedral in New York. Warhol’s will dictated that his estate is used to create a foundation dedicated to the “advancement of the visual arts”. In 1987 the Andy Warhol Foundation for the Visual Arts was founded in his hometown of Pittsburgh and in 1994 the city welcomed The Andy Warhol Museum. The museum’s permanent collection and archives make it the most comprehensive single-artist museum in the world.